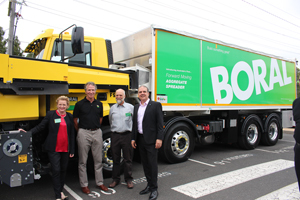 Boral this week has revealed a new road surfacing truck that revolutionises the method of spray seal road construction in Australia and aims to improve worker safety. In an event held at the Australian Road Research Board’s headquarters in Port Melbourne on Tuesday, Boral unveiled its new Boral Forward Moving Aggregate Spreader (FMAS). The new innovative truck improves safety and maximises visibility by dispersing aggregate from the front of the truck via a conveyor belt and spreader box. Until now, the process involved road crews working with reversing trucks that applied aggregate through an elevated tipper body. Aside from the safety benefits for workers, the company says the new Boral FMAS can help complete works quicker and reduce any potential infrastructure and overhead damage, such as contacting power lines, trees and bridges. 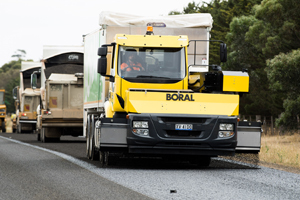 Boral’s National Asset Manager – Asphalt, Stuart Partridge, said the firm designed and developed the machine following a call to industry by VicRoads as a result of a serious accident involving a VicRoads worker a number of years ago. 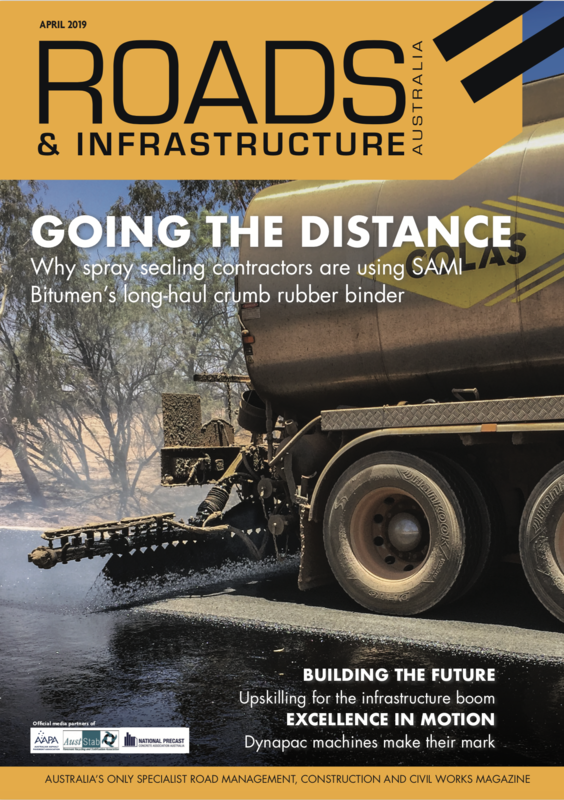 “Surfacing roads has remained one of the most potentially challenging tasks faced by construction crews because of the nature of the material being used and the way that material is applied,” he said. The task, he said, was to come up with a solution to improve safety for road crews and drivers, while making the process quicker, more efficient and with a higher quality.